IT IS perhaps a sign of the times that a government minister has to address the traffic offence of a single individual. The scrutiny plastic surgeon Woffles Wu received this week would have been unimaginable just 10 years ago. But now, it comes as no surprise that many are calling on the authorities to hit him hard. A large part of this backlash lies in a perceived sense of injustice. In many cases, a country's laws are designed to deter, rehabilitate and incapacitate criminals for retribution as well as to lay down a moral marker for behaviour that a society frowns on. However, Wu's $1,000 fine, for abetting an employee to give false information over a speeding offence, is seen as too small a part of his income to fulfil any of these functions. Instead, it becomes a mere fee that a rich man can pay for the right to do what he wants. The backlash also reflects simmering antipathy between the haves and the have-nots. If a delivery man were fined a measly $10 for a similar offence, perhaps few would bat an eyelid. Here, Wu's status as a member of Singapore's rich and famous set is working against him. And it is not just a case of 'tall poppy syndrome', though that surely plays a part; this seems symptomatic of a larger strain on social cohesion. This is, of course, not a uniquely Singaporean problem. Societies all over the world are grappling with the heightened social tension arising from growing income inequality. Some have concluded that inequality is an inescapable part of a globalised world and therefore a new reality that everyone needs to come to terms with. However, political philosopher Michael Sandel has argued in a new book that even if the wall between rich and poor cannot be completely torn down, society can at the very least stop adding more bricks. In his book What Money Can't Buy, Professor Sandel argues that macro-trends like globalisation are not the only forces pushing people apart. At fault are also national and perhaps even local-level decisions on how to run schools, hospitals and even highways. He says that economic principles have increasingly crept into all aspects of everyday life. And when people can pay for the privilege to flout social norms that others abide by - such as to cut queues or pollute the environment - then they go ahead and do so without regard for right and wrong. And he worries that when everything can be bought with money, the rich can more easily differentiate and separate themselves from the poor. The less the classes mix, the more foreign each side becomes to the other. Sandel calls it the Skyboxification of American Life, named after the luxury suites now in almost every US sports venue. Where sports used to bring people together regardless of class to support a common cause, these suites mean the rich can now do so at a healthy distance from the working class. Thankfully, Singapore still has some common spaces where rich and poor can mix, but these are becoming increasingly rare. The country does seem to be headed down the same slippery slope the US is on. Like in the US, there are theme parks in Singapore that allow visitors to skip the normal queues for a fee. Less formally, there is also a growing market for queue-sitters. People are paying hundreds of dollars to students to hold a place in queue for them for anything from a new iPad to a condominium. Similarly, our economic growth has included a multitude of premium services like private banking, private hospitals and private schools that provide avenues for the rich to set themselves apart from the poor. Indeed, this has not been an overnight process but the end result of years of everyone trying to maximise economic value through price differentiation, which in turn has led to an increased social gap. The increasing demand for places in local international schools provides a particularly relevant example. A Straits Times report in February found that three local international schools - Anglo-Chinese School (ACS) International, Hwa Chong International and St Joseph's Institution (SJI) International - were expanding facilities to take in more students. Singaporeans and permanent residents make up half the students in ACS and Hwa Chong international schools, and 60 per cent of those at SJI. Officials from the schools attributed the demand from Singaporean students to the brand names, alternative curricula and smaller class sizes. The Government has always maintained that it prefers Singaporean children to attend local schools for the purpose of building national identity and social cohesion. That meant local students could not enrol in an international school except under special circumstances, such as having grown up abroad. That works well from a social cohesion point of view but is value-destroying from an economic point of view. Value-destroying because there clearly was demand for these schools from wealthy parents. In 2004, brand name schools were given the green light to start international schools that were open to locals. This was to attract foreign students and to give Singaporeans more secondary school choices. That seems to have met some pent-up demand and increased the size of the economic pie but it also undermined the role of a local school as a melting pot. None of this is to say that the economic way is inherently bad or to suggest that all policies should be totally egalitarian. There will be times - even possibly in the examples above - when it makes sense to put a price on a social good. It is difficult to just lay down a firm law on how we decide what to keep sacred. In a country with limited resources, trade-offs will always need to be made. Perhaps we can start with the non-negotiables, draw up a list of areas where money cannot be allowed to differentiate. On this list already are National Service and the National Day Parade. The Government has rightly decided that such emblems of nationhood should not be up for sale. Voluntary conscription might lead to only the poor defending the nation and the sale of NDP tickets might mean only the rich make it to the floating platform. In other areas, there is a need to make sure that the impact on social cohesion, and not just economic value, is factored into decision-making. We cannot preserve every hawker centre or every public park. But when we decide that one should make way, let us do it having taken into account that we may be destroying something money cannot buy. PEOPLE find it hard to like businesses once they grow beyond a certain size. Banks that were “too big to fail” sparked a global economic crisis and burned bundles of taxpayers’ cash. Big retailers such as Walmart and Tesco squeeze suppliers and crush small rivals. Some big British firms minimise their tax bills so aggressively that they provoke outrage. Films nearly always depict big business as malign. 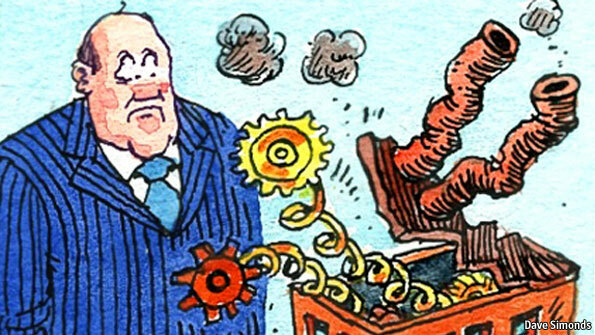 Tex Richman, the oil baron in the latest Muppets movie, is so bad he reads The Economist. Small wonder that whenever politicians want to laud business they praise cuddly small firms, not giants. It is shrewd politics to champion the little guy. But the popular fetish for small business is at odds with economic reality. Big firms are generally more productive, offer higher wages and pay more taxes than small ones. Economies dominated by small firms are often sluggish. Consider the southern periphery of the euro area. Countries such as Greece, Italy and Portugal have lots of small firms which, thanks to cumbersome regulations, have failed lamentably to grow (see article). Firms with at least 250 workers account for less than half the share of manufacturing jobs in these countries than they do in Germany, the euro zone’s strongest economy. A shortfall of big firms is linked to the sluggish productivity and loss of competitiveness that is the deeper cause of the euro-zone crisis. For all the boosterism around small business, it is economies with lots of biggish companies that have been able to sustain the highest living standards. Big firms can reap economies of scale. A big factory uses far less cash and labour to make each car or steel pipe than a small workshop. Big supermarkets such as the villainous Walmart offer a wider range of high-quality goods at lower prices than any corner store. Size allows specialisation, which fosters innovation. An engineer at Google or Toyota can focus all his energy on a specific problem; he will not be asked to fix the boss’s laptop as well. Manufacturers in Europe with 250 or more workers are 30-40% more productive than “micro” firms with fewer than ten employees. It is telling that micro enterprises are common in Greece, but rare in Germany. Big firms have their flaws, of course. They can be slow to respond to customers’ needs, changing tastes or disruptive technology. If they grew big thanks to state backing, they are often bureaucratic and inefficient. To idolise big firms would be as unwise as to idolise small ones. Rather than focusing on size, policymakers should look at growth. One of the reasons why everyone loves small firms is that they create more jobs than big ones. But many small businesses stay small indefinitely. The link between small firms and jobs growth relies entirely on new start-ups, which are usually small, and which by definition create new jobs (as they did not previously exist). A recent study of American businesses found that the link between company size and jobs growth disappears once the age of firms is controlled for. Rather than spooning out subsidies and regulatory favours to small firms, governments should concentrate on removing barriers to expansion. In parts of Europe, for example, small firms are exempted from the most burdensome social regulations. This gives them an incentive to stay small. Far better to repeal burdensome rules for all firms. The same goes for differential tax rates, such as Britain’s, and the separate bureaucracy America maintains to deal with small businesses. In a healthy economy, entrepreneurs with ideas can easily start companies, the best of which grow fast and the worst of which are quickly swept aside. Size doesn’t matter. Growth does.